It may of course be nothing more than arrogance on my part when I told someone that I've pressurized Molden Heath's market to a more reasonable level through my constant stocking and efforts in Bosena. I feel a bit pompous to voice my pride and pleasure at the way the last six months have gone. Yet, the signs are all around me. The general regional prices are down and staying down. 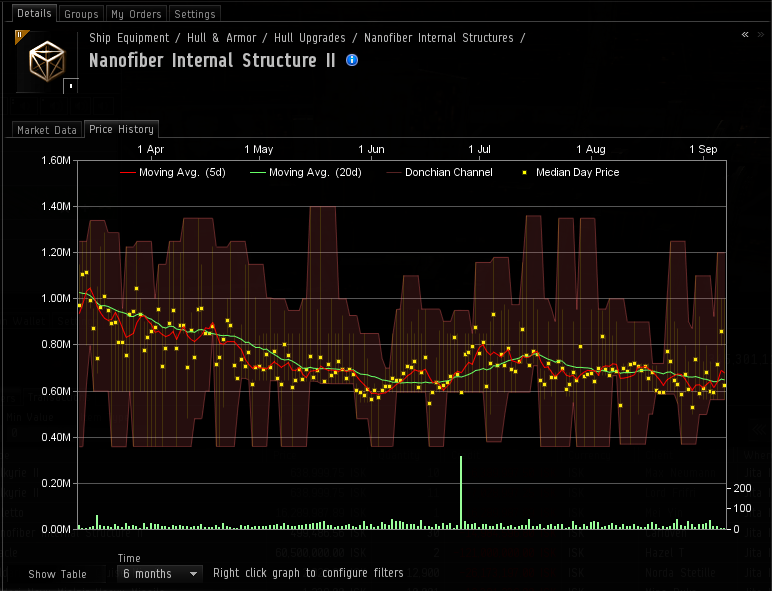 I keep a volume of around 12 billion ISK on the market at the moment. 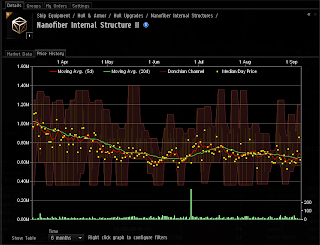 I've been draining ISK to fund my Jump Freighter. Once that is done I will focus back on adding a few more higher priced items to the local market. Before, they sold, but not often. Adding things like T2 cruisers and Battleships will be a big financial drain that may not have enough payback to be worth it to me. I'm not completely giving and saint like. I've often had people admit that they were selling for high prices in Teon. I've kicked more casual marketers in the face then I first realized. Some people were fine with it. It seems that the desire to have a market for themselves and others is strong but running the market does not appeal to everyone. As I dance in, eyes bright, frantically pointing to price fluctuations and odd buyouts I realize that people are thrilled that I am thrilled and maintain it. When we returned from our recent deployment there were several cries of joy over having the market again. We were near Jita the entire time but it was not the same as bouncing two systems over in low sec and reshipping and resupplying. Of course one could say that my boys buy from me. But who else buys from me? Part of focusing on the project that is The Cougar Store is looking at who is buying. If it is only my boys, the numbers only show part of the story of a market hub that I am trying to share. That story would have to be augmented with an already established social group willing to buy from that market. That would limit its accessibility to people who want to try to carve one out of a solid looking piece of space. For many who know me or know Molden Heath an assumption can be made that my market is supported by my own social group. Part of the entire project of The Cougar Store was to provide a reasonable market to those people. The secondary aspect was to provide a reasonable market the the entire region. With 7-2, THCS deployed for the weekend it created an opportunity to look at the store without its most loyal patrons. I know that I sell about 40% to my boys. Other people do not because they do not have my wallet access. I do look at who buys. I'm curious that way. It also tells me a lot about my customer. Are my prices bringing people from high sec? What is the flavor of the month? The current flavor seems to be buying me out. I've had people who I do not recognize buying my stacks. They tend to be items that are much lower than the rest of the region. It is also a reflection of the reactivation of null sec as they wind down from their wars and start in on their regular activities. My fuel and cyno sales have shot back up after flat lining over the summer. We have a sudden influx of capital traffic again, making for messy cynos and fun possibilities. I'm happy with this project. I feel good about it. I've relaxed a lot. Sometimes it may take a day or two to get things filled. I'll go on a fleet instead of stocking for instance. I don't feel guilty if something goes off market. The forces of other players are more than I can counter at any given times. I'm halfway to my Jump Freighter goal. I realize that I over listed a type of ammo the other day and gave myself a rather painful brokers fee. Normally I am fine but sometimes an extra zero or three happens. That may be the most common error that I make. It sets me back each time but it is recoverable. I think I may just move ISK out of the wallet before I start to list so that such a mistake will not go through. The entire thing is a process. I've come to enjoy it greatly. I'm not station trader. I don't roam the space lanes picking up item and dropping them off to roll in ISK. I don't have that time or that motivation. What I do, to me, seems simple. it takes some focus and dedication and dare I say want. Without want it would be a much more frustrating project. The store is not consistent. Some weeks things die all the way down. 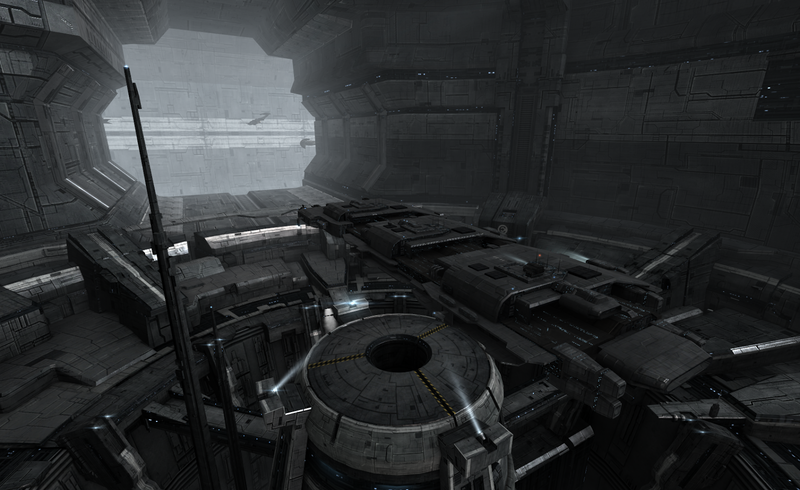 Other times, stacks of pertinent items such as armor rigs sell out as I am enroute from Jita with a delivery. A delivery that does not include those rigs because they were not sold out when I started. Items that sell well for weeks will not sell for months. There is zero consistency and great need. This is a project that is more then capable of spiraling out of control and being all consumptive. While time and energy needs to be devoted to it, like any other Eve project limits have to be set. For me things like my bedtime or fleet activities take precedence over the market. Small and simple as these limits are they have helped me not tip over the frantic edge where a project goes from fun to frustrating. Teon is just 8 jumps from Rens. Can't you stock up there? Or if Jita is so much cheaper than Rens, maybe you could branch out to Rens to supply more people and get more ISK. Rens is quite often more than Jita. On an individual player level it is not worth going to Jita to save the ISK. On the store level is is well worth it. Rens is prone to manipulation on many levels due to its smaller size. I have stopped there before and I constantly have issues with prices for meta items and various rigs. it is not worth my time. I've often found meta prop mods selling for hundreds of K in rens when they are a handful of ISK in Jita. I'm not interested in riding these waves of speculation. I'm often on a tight hauling schedule. My commitment is bringing the lowest prices to low sec. I'd be completely justified to shop and Rens and sell in Bosena. However, the stores beauty is bringing those Jita prices and stability to the region. Its the trust that my boys have given me that they are getting a reasonable price for my energy of getting the item to them when they restock from me instead of restocking from Jita. So no. Rens might be more convenient but it is not what the soul of my store needs.